Couscous is always a favorite in this household. I usually migrate towards the Italian Couscous that is a little bit more bigger than this one just because you feel more full when you eat it. Its just a psychological thing and nothing more. The Lemony Couscous Salad (which was also featured in Buzzfeed) was my go-to couscous recipe always till I decided to experiment a little with other flavors to go with couscous. One of Ottolenghi’s book had a couscous dish with harissa in it and I made it once for a New Year party and it was a huge success. Everyone loved it! One of my favorite recipe with harissa in it is a Harissa marinated Chickpea Salad and I figured why not put the two together. When FoodieMamas theme for this month was announced to be Couscous, I was beyond thrilled to try out my little recipe idea. My initial thought was to make it cheesy something, but I figured that may not be the best idea and decided to make this wonderful, fresh and aromatic Skillet Harissa Couscous. We all loved it, even the little guy and the husband took it to work the next day for his lunch! 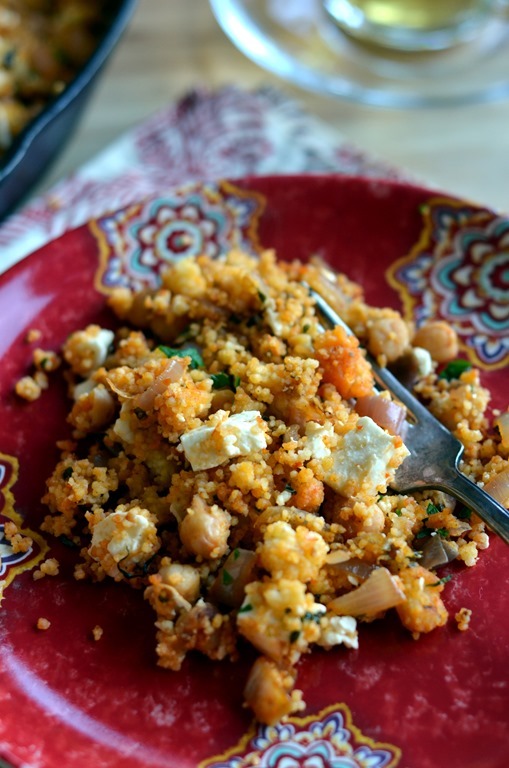 So, here is the newest Couscous recipe addition to our family’s dinner file, that I am sharing with all of you. Heat the oil in a cast iron skillet and add the shallots and garlic to it. Once browned a little, add the harissa paste and let it cook for a couple of minutes. Throw in the chopped spinach and saute till the spinach wilts. Add the chickpeas, paprika, salt and pepper and mix well. Lower the heat and add the feta and the lemon juice. Mix well and remove from heat. Garnish with the minced parsley and serve warm. Lets take a look at what the other Foodie Mamas have in store for us this month with their Couscous dishes – from wonderful salads to couscous stuffed peppers to couscous patties to a warming soup. Do check them out by clicking on each picture in the photo grid below and let them know how much you love their couscous dish. This type of dish is right up my alley. Also, your pictures are mouth watering! This is a beautiful recipe! Couscous is a grain I have worked with in the past. It is a nice light textured base for healthy meals. 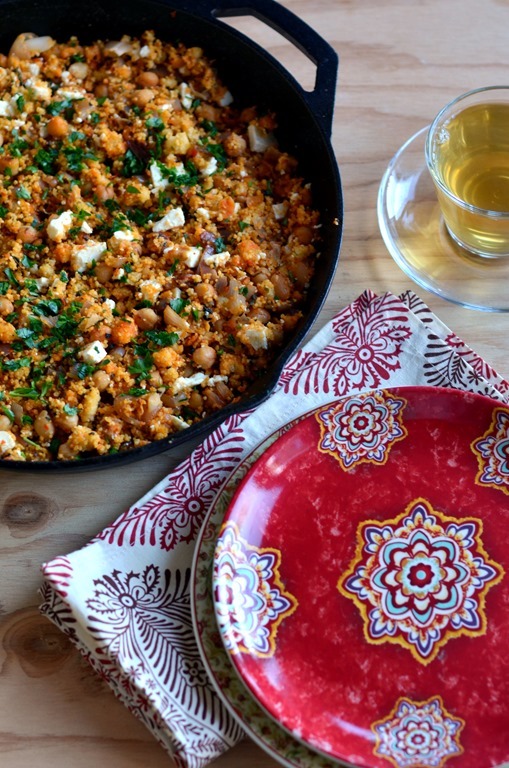 I’m looking forward to hunting down harissa so I can make this yummy dish! This looks like such a hearty, satisfying meal. I love harissa! What a pretty menu item. I love having food that appeals to the eyes as well as the taste buds. This sounds simple enough for a weeknight meal. Adding to my list of recipes to try. What a wonderful combination of flavors. This NEEDS to go on my meal plan next week! I love the aroma of harissa and couscous is one of my favourite things to eat. Perfect for an easy weeknight dinner. Wow! Very tempting recipes to try plus the pictures? Makes me crave now! So hearty and and such a great flavour combo – perfect comfort food in this frigid weather. Mmm this sounds absolutely delicious! Do you think it would work as well with Israeli couscous? And I just (finally) got some harissa again… The store where I used to buy it stopped carrying it, and it took me a while to find a new source. But I have everything but the cous cous which I can’t eat – I think I”ll sub millet.) What a perfect combination! Thanks for the inspiration! You are very welcome Anne! The millet should work fine! ? 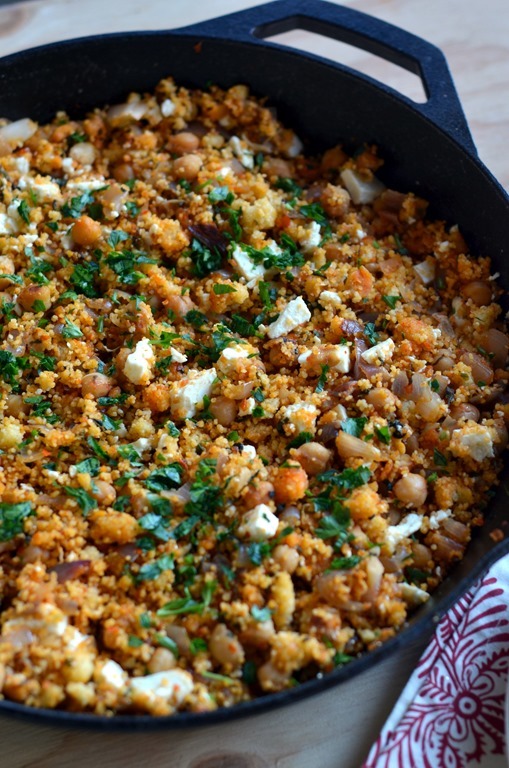 This couscous dish looks fabulous! I love harissa, and all of the other ingredients too! I’m hosting a dinner party for several vegetarian friends in a couple of weeks, and this may be on the menu… Pinning! This is totally doing it for me. Love, love, love.